According to Mainers, Corea is the real Down East deal. Having explored Portland, Casco Bay, the Midcoast, and Acadia National Park numerous times, we wanted to experience a different side of Maine. For our 7th Mainecation in eight years, the hubs, Donut, and I trekked farther Down East than we had ever ventured before. During our leisurely lobster-filled stay on Beals Island in this uber-charming Airbnb, I couldn't resist squeezing in a little oyster adventuring. 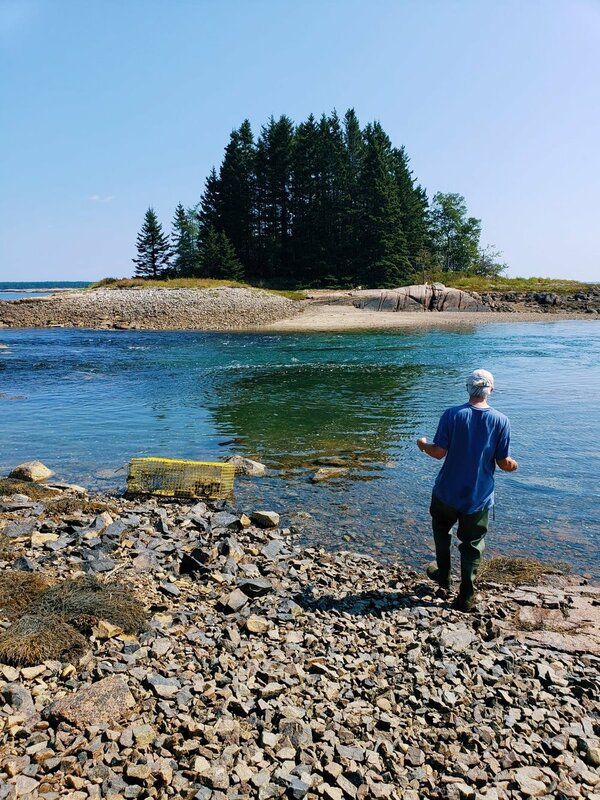 So on a sunny midweek morning, I left my sleepy boys in bed and drove down Maine's scenic Coastal Route 1 to the Schoodic Peninsula to visit Joe Young's oyster farm in Corea. A quick drying t-shirt or long-sleeve shirt that you don't mind getting dirty or wet. Hiking shorts or pants that are water resistant. Avoid jeans and dress pants. If you're going in the water, wear water shoes at a minimum. Scuba booties if you have them. If you're walking around a muddy lease: Rain boots or work boots. An extra pair of socks wouldn't hurt. No open toed shoes or sandals. No sun dresses, heels, anything fancy. On the way over I learned that Joe worked as a lobster fisherman in Corea for most of his professional career, like many of his neighbors. 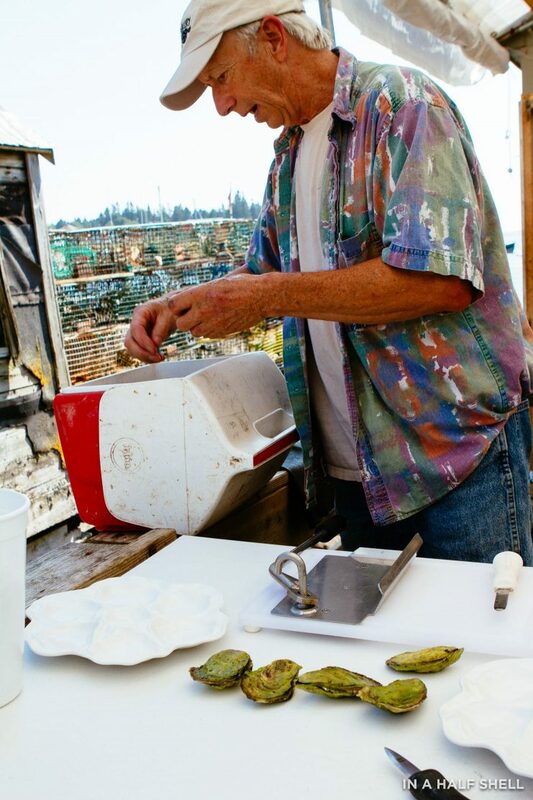 Now in his mid-60's, he is "semi-retired" and divides his time across multiple endeavors: tending to his oyster farm, experimenting with seaweed (more on that later), and maintaining the seasonal Wharf Gallery & Grill in Corea Harbor. 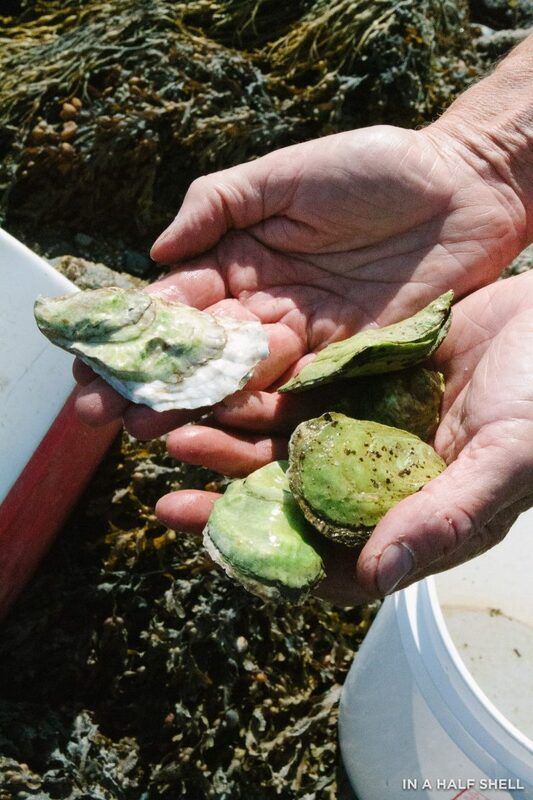 In 2013, Joe came across the Maine Sea Grant's Aquaculture in Shared Waters program, a federally-funded training initiative that empowers fishermen to start their own aquaculture ventures farming oysters, mussels, clams, and/or seaweed. The idea of aquaculture piqued Joe's curiosity, and the opportunity to diversify his income sources certainly didn't hurt either. So the sixth-generation Corean—the Youngs were one of two founding families of Corea—became a first-generation oyster farmer and began raising Maine's easternmost oyster in their family-owned salt pond. We arrived to the edge of the pond and I took a moment to soak in the beautiful scenery. It looks just like how photographer Damon Winter captured it for the New York Times story, but much sunnier. "When we were kids, this [pond] was our playground." There was no adult supervision, no guardrails, no electronics, and the only rule was to be back to the house for supper. I could relate to this scenario as I also recall having similar unsupervised, unstructured days while growing up in Indiana. Except instead of a salt pond with periwinkles, I played in a babbling creek with crawdads. Taking care not to step on any live shellfish, we waded slowly through the cool, shallow water. The bottom glistened with oyster shells, mussel shells, periwinkles, crabs, and tufts of seaweed. Joe's oysters have been so popular with the locals that he's pretty much run out of market-sized product for this year. He warned me that we probably wouldn't find many big ones today. His oysters currently don't have a name, nor are they sold anywhere else but at his restaurant, the Wharf Gallery & Grill. They're just listed as Joe's Homegrown Oysters on the menu. Despite this, Joe's oysters are remarkably distinctive in color and cleanliness. His farming process is pretty straightforward. Joe grows juvenile seed oysters in mesh bags that are stacked three bags high and held together by metal structures aka "oyster condos." Once they're big enough to fend for themselves, Joe broadcasts them across the pond floor. He doesn't use a tumbler at all, making the cups a touch shallower than what the premium market sort of pines for nowadays. They're still just as pretty as any boutique oyster though! My favorite part about Joe's oyster plot is its resident clean-up crew. Periwinkles help keep the oyster shells sparkling clean by grazing the algae growth. These crabs are so resilient that even stranding them 100 yards from the water won't squelch their survival! "I tried dumping them into the woods, but they find their way back to the water somehow," Joe said, clearly frustrated by the death-resistant pests. He's resorted to capturing them in cages (see above) and dealing with them in an unconventional, but effective manner. I won't get into the gory details, but it involves a wood chipper. I wonder if they're tasty and could be turned into a marketable product? Just when I thought I had seen everything, Joe saved the big surprise for last. "Wait ashore," he instructed as he waddled into deeper water. Joe lifted up a thick blanket of frilly dark green seaweed. It was one of the many lines of sugar kelp that he also farms! Seaweed farming is a booming business in Maine, as well as other coastal states. Being Chinese, I grew up eating seaweed in soups, as snacks, and with congee. Mainstream Americans are finally beginning to embrace its diverse culinary uses and great health benefits. There are number of edible seaweeds available for purchase today. Joe produces dulse, sugar kelp and digitata (aka horsetail kelp). The easy part is growing the plant. The harder part is figuring out how to turn it into a usable form. That's where the experimentation comes in. We stepped inside Joe's self-constructed seaweed workshop/dehydrator room. On the left wall hung a line of dried kelp ready to be shredded. On the right sat a sleeping furnace. The room was already pretty toasty, but apparently it could get much, much hotter with the furnace on. Joe's main focus was on his new toy, a custom-built seaweed mulcher that transforms large pieces of material into small flakes. Like a vegetarian meat grinder, I suppose? I got to see it in action, but Joe wasn't 100% satisfied with the output. It's still very much a work in progress for him, and the other part of the work will be to figure out how to market it. Touring the farm worked up an appetite, so we headed to the Wharf Gallery & Grill for an oyster tasting and lunch. Although the seasonal eatery has become a foodie destination, Joe never intended on owning a restaurant. Selling food was just a (great) way to lure people into the gallery—a showcase for Joe's aunt Louise Young's photography from the 40's, 50's, and 60's of Corea. The walls are neatly decorated with black and white photos of the town, the working waterfront, and its people (including a portrait of the famous American painter/poet Marsden Hartley). After getting a chance to try Joe's beautiful chartreuse-tinted oysters, I helped the crew out by opening a few dozen for hungry customers including Catherine Schmitt, Communications Director for Maine Sea Grant. Then I finished my meal and day in Corea with an ooey-gooey lobster grilled cheese sandwich that totally hit the spot. The restaurant is just about to close up shop for the 2018 season (last day is Columbus Day) so you better hurry in! Joe's oysters may not be available, however. 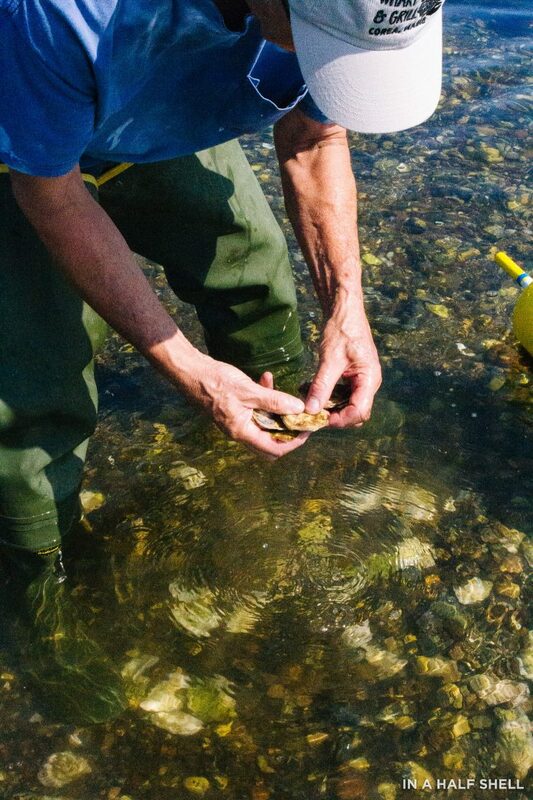 Part of the coastline, which includes Joe's lease, has been temporarily closed to shellfish harvest due to the presence of naturally-occurring biotoxins in the water. If you're curious about what thought of Joe's oysters, check out the flavor notes on my Instagram post! Planning a trip to Maine? Be sure to check out my extensive Maine Oyster Trail Part 1 post for ideas about where to go for oysters. You can also check out my very first trip to Maine on my old Peek & Eat blog!